Take your applique to the next level by making it totally reversible. It is really easy to do with machine embroidery. Just place applique fabric on the back at the same time as the front. Start out with a cotton hand towel. You can purchase one or make your own. 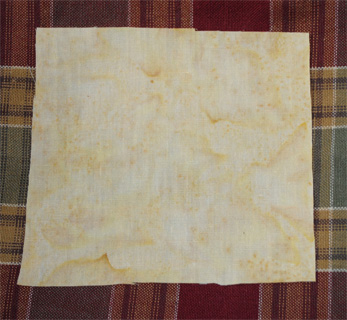 Since I'm adding autumn leaves, I chose a dark orange Moda marble fabric and a beautiful Bali hand-dyed watercolors 1895 batik by Hoffman called Garlic. Marbles and batiks are perfect for this kind of applique because of their color variations. They mimick changing leaves and blend well without competing with the background. 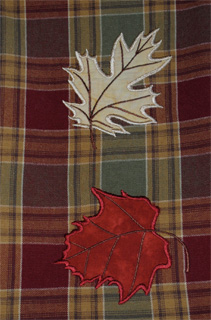 The leaf embroidery designs are from Amazing Designs Applique Leaves. I used Leaf 102 and Leaf 101, respectively. Hoop water-soluble stabilizer (I used a mesh variety). Place the towel on the stabilizer using temporary spray adhesive or lapel stick. Be sure to use the same color of thread in the bobbin as that which you are stitching. That way, the back will be finished just like the front, no white bobbin thread. There are four color stops with only two color changes, so this stitches out pretty quickly. The first stitch-out is the placement stitch. It shows how large the a piece of applique fabric needs to be. 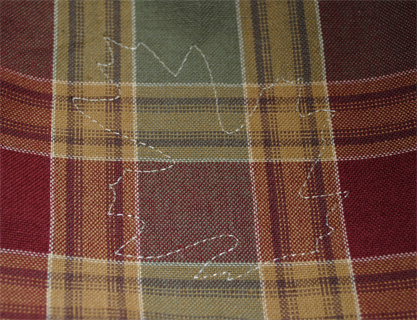 Cut two pieces of applique fabric large enough to cover the stitch area shown. 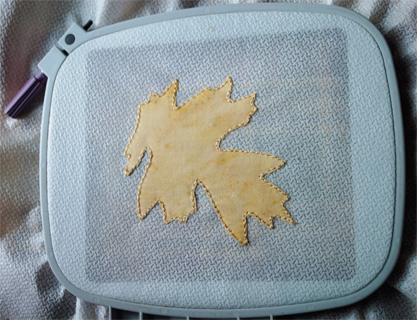 Press the towel and applique fabric with an iron. Apply temporary spray adhesive or lapel stick to the wrong side of the applique fabric and finger-press it over the stitch our area on the front and back of the hoop. 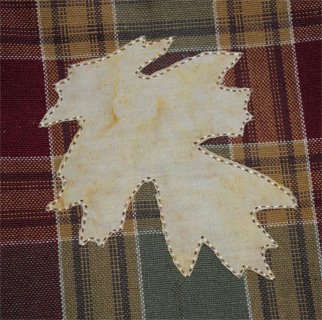 The second stitch-out tacks down the applique fabric on the front and back simultaneously. Remove the hoop from the machine but leave everything in the hoop. Carefully trim around the tack-down stitches on the front and back of the hoop. Applique scissors are specially made for this as they can cut extremely close to the stitch line. 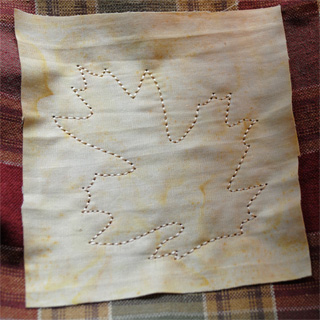 The third stitch-out, a color change, creates the leaf veins and stem. The final stitch-out is the underlay and satin stitching around the outside. I love Amazing Designs' applique because it has very generous satin stitching. That is especially nice if it is the first time you've tried applique or reversible applique since you want front and back edges to be well covered. 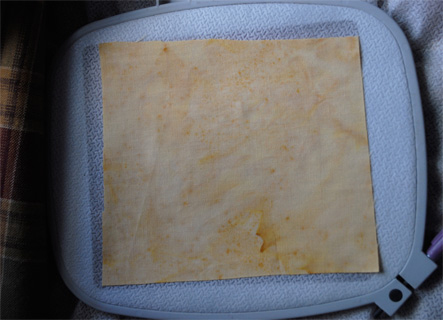 When stitching is done, remove the towel from the hoop and cut away excess water-soluble stabilizer. Re-hoop another piece of water-soluble stabilizer and stitch any additional leaves the same way. When done, rinse away excess stabilizer, let the towel air dry, and press. It will be really hard to tell the front from the back and everybody will wonder how you did that! Love the idea. I have stitched onto bath towels and wanted to have the back to look as good as the front. Now I can do that. 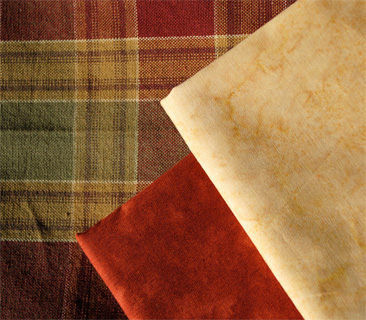 With bath towels, you will want to also use a water-soluble stabilizer on top of the toweling. That will help to keep your stitches from from sinking into the towel fibers.